American U.S. Flags - Polyester - This heavy duty American made US flag offers sewn stripes and embroidered or appliqued stars - These U.S. flags are made of tough 2 ply polyester; the strongest, longest lasting flag material developed for maximum durability in unpredictable weather conditions. 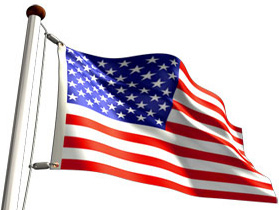 Polyester American flags outlast nylon American flags and are an excellent choice for commercial or industrial use. We are proud to include 2-Ply Polyester fabric in our product line. It is the "top of the line" choice in the polyester flag market. Woven of 2-ply polyester yarn that combines the strength of polyester with an additional richness of color. It is the natural choice of flag users who need the extra durability that can be gained by the use of the 2-ply polyester.